With its sleek lines and stylish contours, the new 251 Hybrid offers a fresh new look and a 25-foot addition to the NauticStar Hybrid lineup. This unique multi-purpose vessel offers the perfect size and features for a family friendly pleasure boat and a tournament ready fishing platform. Rated for up to 350 HP and a capacity of 12, the 251 will get your crowd to the fishing hole or sand bar in a hurry. Yamaha Outboards1 tested the 251 Hybrid with some impressive results. Powered with a 300 HP four stroke V6, F300XCA, it planned in just 3.81 seconds and had a top speed of 52.5 MPH with a fuel burn of only 3.78 MPG at cruise. It has a fuel capacity of *75 gallons. Teleflex SeaStar® Pro hydraulic steering with tilt is standard. The 251 is a true hybrid with innovative features that are showstoppers for both anglers and pleasure boaters alike. The large aft deck, completely covered in SeaDek®, has an oversized fold-down jump seat that quickly converts the deck to a fishing platform. Beneath the jump seat is a nice size storage compartment. And, the entire seat lifts to expose the integrated SmartStar™ access hatch. This convenient feature allows easy access to pumps, batteries, hoses, and the bilge area. To add to the unique features of the aft section of the 251, a 16 Gal. livewell/baitwell and telescoping boarding ladder are located starboard while a 40 Qt. swim-up cooler is located port side. The swim-up cooler makes grabbing a cold beverage while enjoying the water convenient. Turning attention to mid-ship, the 251’s leaning post consist of premium, ergonomically correct Llebroc® seating with flip-up bolsters, folding armrest and footrest. Behind the seat is a freshwater galley with sink and cutting board and rocket launcher rod holders. The integrated D-channel fiberglass T-top has LED courtesy lights, radio box, rocket launcher rod holders, and integrated 3-sided windshield. The large dashboard has room for two 12” electronics displays, lighted stainless steel pushbutton switches, drink holders, flush mount compass, Yamaha® 6YC digital gauge, and Infinity® PRV 315 Bluetooth stereo with all new JBL® marine speakers. On the front of the console there is a forward facing seat with 16 Gal. livewell/baitwell. The bow is where the comfort and functionality goes to another level. Plush cushions fill the U-shaped bow along with the flip-out backrests that allow you to stretch out and relax. Under the starboard side seat there is a large, 43 Gal. insulated fish box while the port side has a locker for 5 rods. In the center, there is a removable 45 Qt. YETI® cooler. You can also fish from the flat nose area, which also includes another boarding ladder and anchor locker. A windlass anchor system can be added as an option. To sum it all up, the 251 Hybrid has everything needed for both fishability and pleasure boating. With the available options, the 251 can be customized to fit anyone’s lifestyle. 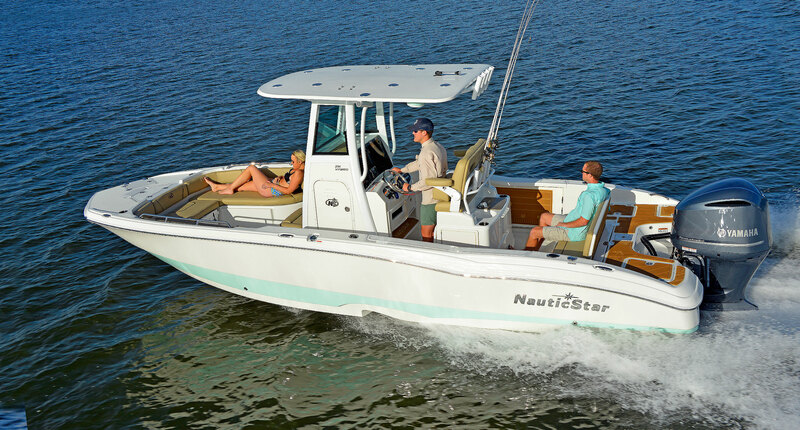 See all the features and benefits on the NauticStar Boats website and build the boat of your dreams with the boat builder. Go to NauticStarBoats.com for more information.